The vision for the school started with a tree. I remember returning from eastern Congo last summer. This was the third time traveling with my husband and a team to the Democratic Republic of Congo. We spent our days with the children playing games, reading stories and learning one another's language by pointing at objects and repeating either its English, Swahili or French name. We also spent time with the mamas, papas, older girls, older boys, staff and leadership having many conversations and listening to their stories and dreams sitting by mango trees and cassava plants. I remember distinctly my teammate Ashleigh spending an afternoon with the cooks to improvise an oven-like system in order to make chocolate chip cookies. I remember the kids putting on a talent show and blowing us away with their dances, skits and dramas. My friend Tim and I showed them the game "snaps" and they excitedly chatted back and forth trying to figure out how we were communicating. Each year I travel there, it is both so familiar but always new. Familiar in that I feel increasingly confident navigating the hilly road up the mountain to the center or from the Bujumbura airport to the UN base. However, with each year, I see new buildings, marketplaces buzzing with commerce and the children growing in stature. The boys becoming men and the girls growing into beautiful ladies - they grow up fast! The center sits on a picturesque spot on the side of a mountain overlooking the city of Uvira. Blessed with lush land and an overlook that inspires possibility, the leaders at the center envision a school taking root on their land open to children of the community who cannot afford school fees otherwise. Working on the operational and registration plan for two years, they now needed a building. 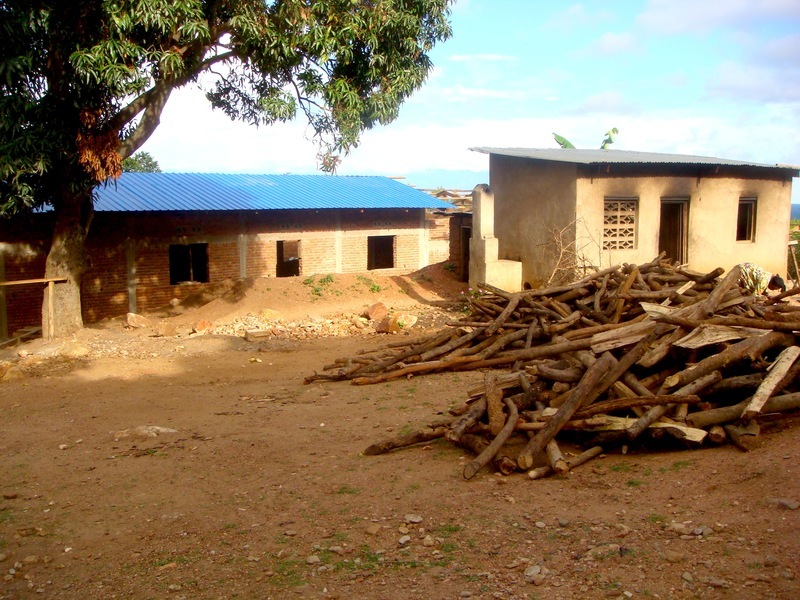 Two months ago, we embarked on fundraising efforts to raise $54,435 for the construction of a 6-classroom primary school. Partnering with two nonprofit organizations and a dedicated corps of team members who advocate like its their job, the funds were miraculously raised by the beginning of April. I am just in awe of how much support and generosity has come forward to make this dream a reality for over 200 students. The construction is progressing smoothly and the school will be finished by the summer and ready for students by the start of the academic year in September. Purchases of Kicheko have invested in Mango Tree School and for all the new friends and supporters I have met along the way, I am so grateful. Here are a few more photos of the construction's progress. Posted on May 5, 2014 by Sarah Bayot.